While discussing activities for the weekend, one of our friends told us that she was going to visit the ghost town of Doel in Belgium with another friend to take pictures. They would drive there by car, and we were invited too. In the end, the friend with the car canceled, but why not just cycle there? On Friday we got on the train to Goes and stayed the night at my parents' house. On Saturday morning, we headed east towards Antwerp. The weather was sketchy, but expected to clear up, which it thankfully did. We had booked a hotel in Hulst for the night. At 75 kilometers, it would be a serious day of cycling, but nothing we couldn't handle. 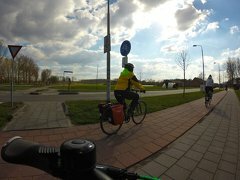 Although I grew up pretty close to the area, I had actually never cycled through Reimerswaal, the "neck" that connects the peninsula to the rest of the Netherlands. There was not much to see. Although the sky cleared up, there was still a cold wind. Two people in our group were getting cold toes that were hurting and going numb. We were able to alleviate the problem somewhat with some duct tape on the shoes. It didn't look that great, but it blocked some of the cold wind. 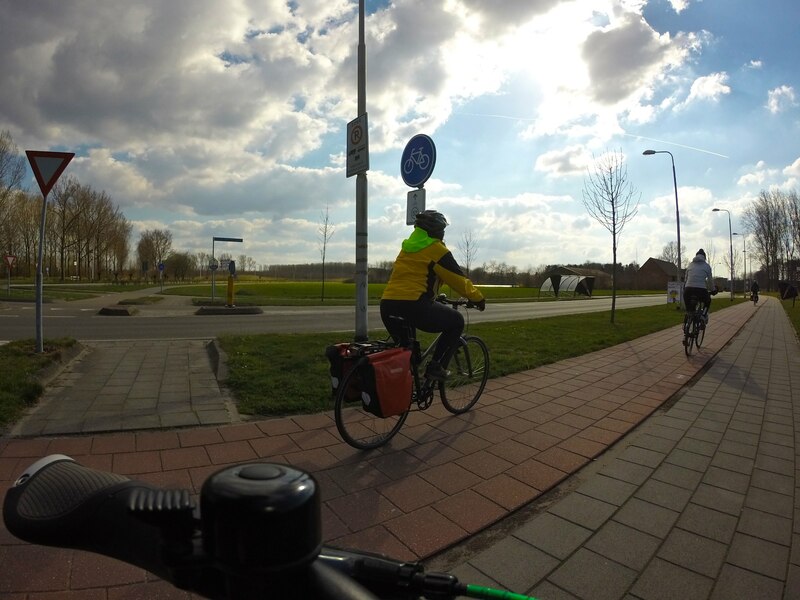 Video of 9:25 minutes of cycling to Antwerp, Doel and Hulst. In Krabbendijke we had some fries as a late lunch, and pedaled further east past Rilland and Bad, and suddenly found ourselves past the Belgian border. 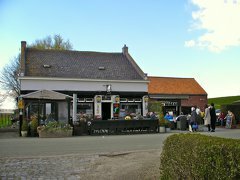 We continued through a huge industrial area leading up tot the port of Antwerp, until we reached the old fortified town of Lillo, which was now trapped between the river and industry on all sides. The ferry that we had planned to take to Doel was not running that day, which left us stuck on the east side of the river. The map showed a crossing further south, but that turned out to be a tunnel for cars only. We decided to head towards Antwerp and curve around. We soon started to realize that we would not be able to make it to Hulst, where we had booked a hotel for that night. We called the hotel, and were able to move our reservation to the next night. We arrived in the city of Antwerp late in the afternoon, and now had to find a place to sleep. We inquired at several places, checked all the booking websites, but could not find any place that had beds available that night, as it happened to be Easter that weekend. Although I felt I could probably cycle to another town, the rest of the group was more tired and sore already. I was getting quite worried about having nowhere to stay. We could make it to the train station, but due to work on the tracks there were no trains back to The Netherlands that day, and there was not much chance of being able to take four bicycles on the bus. We eventually decided to take the train deeper into Belgium instead. 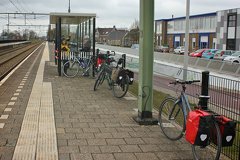 We cycled to the station, where we arrived just in time to miss the train to Sint-Niklaas, so we had plenty of time to get on the next one. 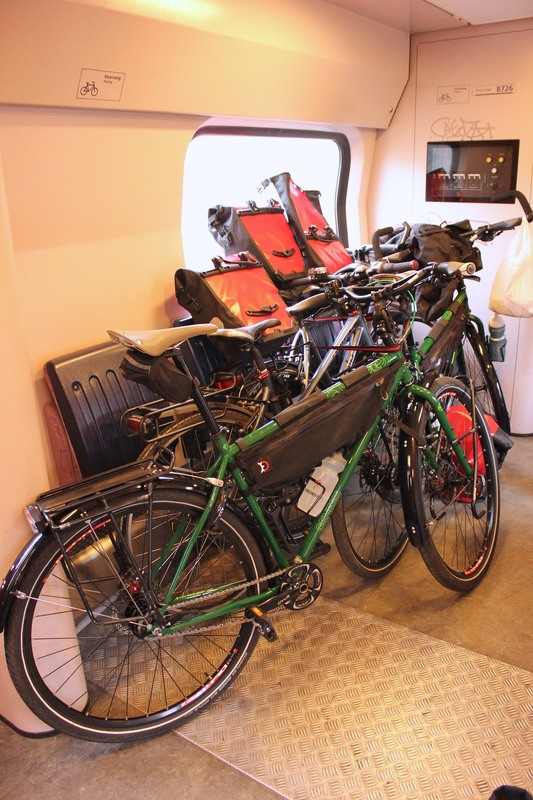 It had a nice big compartment for bicycles, where the four of us fit in without any issues. In the train we booked one of the two hotels that had availability. After we arrived we cycled to the city center. The hotel was quite nice. It was getting dark by the time we arrived, and we were very tired. We had not had dinner yet, and decided to pamper ourselves and dine at the hotel's restaurant where we ordered just before the kitchen closed. Our four bicycles in the train. Lunch break at the train station of Kapelle, we did not take the train. 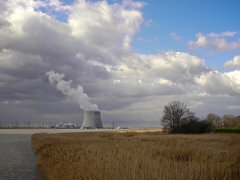 The cooling towers of Doel's nuclear power plant seen from Lillo. With renewed energy, we left Sint-Niklaas in the morning and cycled northeast towards Doel. It was Easter Sunday and the roads were empty, with the surroundings alternating between desolate and industrial; a fitting route to a ghost town. 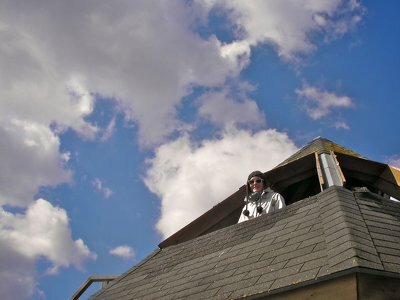 The air was cold, but the sky was clear. 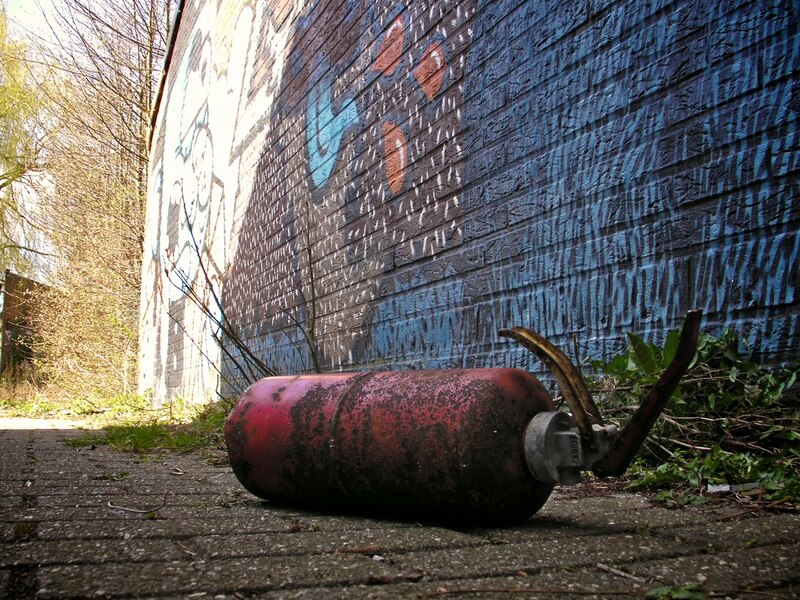 There were surprisingly many people in Doel; cars, motorcycles, people walking their dogs and taking pictures. The ghost town has become quite a popular tourist destination, especially on a weekend with good weather. Some of the abandoned buildings were boarded up, while others were freely accessible. Fences meant to keep people out were laying on the ground, having been trampled many times before. Doors were missing and there was broken glass everywhere. Some of the buildings were being overgrown from the inside out and had sharp, rusty things sticking out. 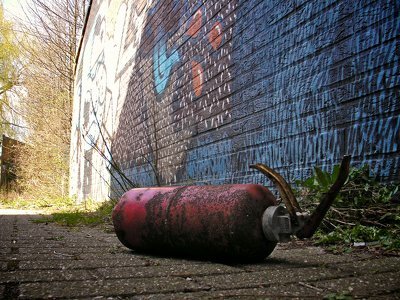 Fire extinguisher on the street. 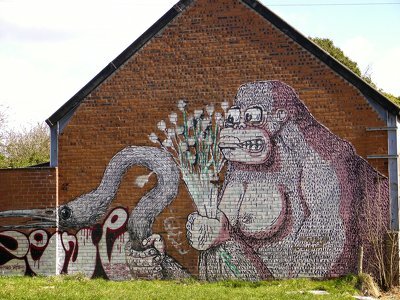 Most of the buildings in Doel are covered in grafitti. We were just in time to see the ferry arrive from Lillo. If we had left that day, it would have been no problem to reach Doel. 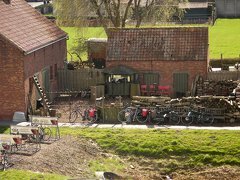 We left the town and cycled towards the Dutch border, which was not marked anywhere. We had a quick stop at the Verdronken Land van Saeftinghe, a nature reserve of marches in a place where there was once a town that was flooded hundreds of years ago. A quick stop at the verdronken land van Saeftinghe. We continued west toward Emmadorp. There were few houses in the area, but there was a nice and busy restaurant where we had a late lunch. All fueled up, we set course towards Hulst, where we were to stay for the night. We arrived late in the afternoon. Shops in the town were closed. We took a walk along the city wall and had dinner at a nearby restaurant. As it was a busy weekend, we had to wait a while to be seated. Bicycles parked next to the restaurant. The only restaurant in Emmadorp. We left the hotel in Hulst in the morning and set course for Terneuzen. The weather was cloudy, the pavement was good, but the route was not that interesting. We made a short stop in Zaamslag, where we called the bus company to arrange a reservation for our bicycles. You need to do this at least an hour in advance if you want to take your bicycle through the tunnel. When we arrived at the bus station with almost an hour to spare. After a short while a small bus arrived. I asked the driver if he was here for the bicycles, which he was. It turned out that we were supposed to put the bicycles on the small bus and then wait for almost an hour for a passenger bus, and then retrieve our bicycles on the other side. Thankfully the driver allowed us to ride with our bicycles, so we did not have to wait and pay separately. One euro per bicycle was all it took to get across. 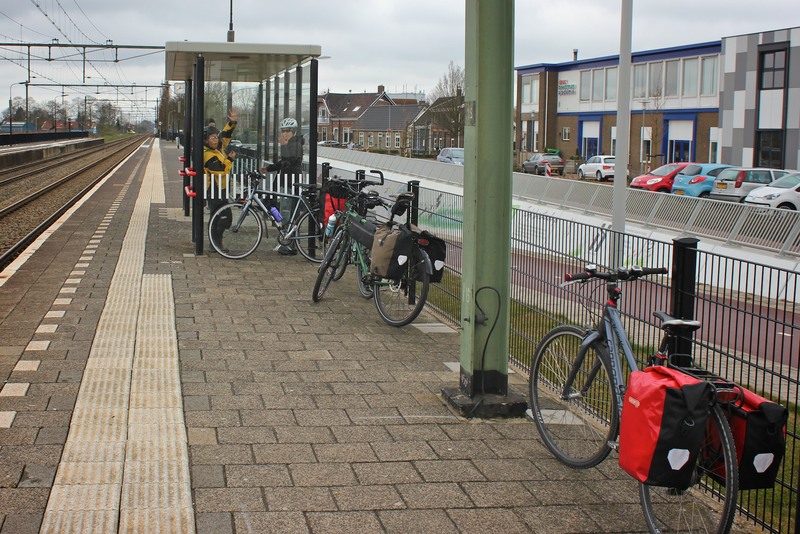 After going through the tunnel, we split up the team; our friends cycled directly to the closest train station and Mimi and I made a stop by my parents house before cycling to the train station and heading home. It was a challenging trip and not always fun, but certainly memorable. Not everyone was properly prepared for the cold weather. In retrospect, we could have known that the ferry was not going on Saturday. Faced with the prospect of not having a place to sleep in Antwerp after a hard day of cycling really left me feeling down. 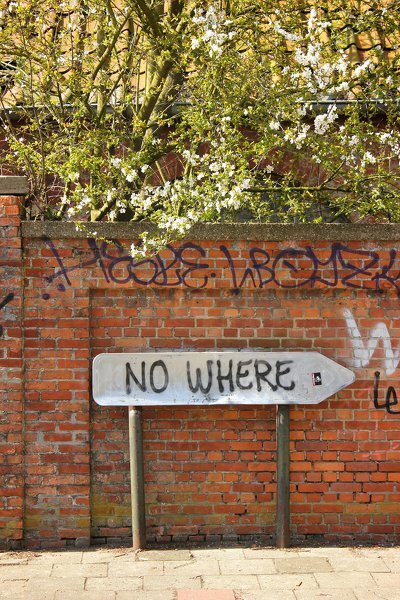 For a while I could not see a solution, but in the end we came up with a plan where we were still able to accomplish the trip's goals, at the cost of a train ride and an unexpected night in a town not on our original itinerary. Next time a trip includes a ferry I will certainly double check that it is running!